The “T” in DXA-2T stands for Tough. The die cast aluminum chassis, recessed switches, detachable output cable and optional protective rubber boot make this virtually indestructible. Robust, passive circuitry provides unmatched sound quality with an extremely wide dynamic range, flat frequency response, no distortion, noise or clipping problems. And best of all, it requires no battery to operate. Made from the finest components sourced around the world. The two channel, DXA-2T is very easy to set up and use. 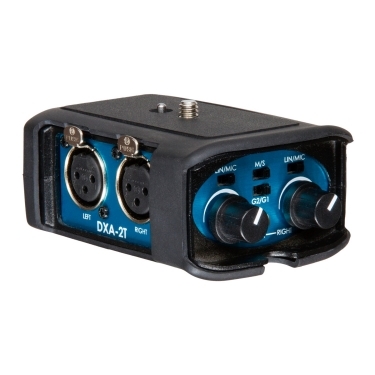 It allows you to connect professional microphones with balanced XLR connectors to any camcorder with a mic jack. You can also easily connect wireless microphones and mixing boards. The adapter gives you all the benefits of using professional audio gear and noise free balanced inputs for superb audio. You can select either mono or stereo output mode and the independent trim controls allow you to set the ideal recording levels for each channel. Fits neatly under any camcorder and can also be mounted to a tripod.